My city, Akron, boasts a myriad of ways to deliver art and culture to we, her lucky citizens. Our local arts scene is thriving beyond all proportion to our size, geography, and, I’d guess, our reputation. Much of that is a grassroots phenomenon, driven by people like my own better half—embedded artists doing much more than their own fair share to serve us all by serving up the arts. But due credit must go to the municipality as well, which puts as much effort into that same noble cause that some towns devote to rib fests and hot-dog eating contests (not that there’s anything wrong with either of those). 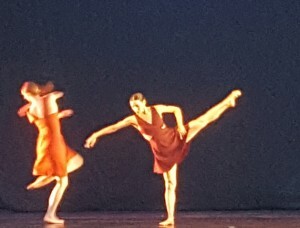 The city’s summertime Dance Festival is one example among many, but it’s at top of mind for me at least as I’ve spent the last two consecutive Fridays taking in the dance performances that my city has worked so hard to bring before me. These weren’t my first such exposures—a couple years ago I reported on my attendance at a truly stunning performance by Ballet Hispanico. It was transformative; at the time I noted that dance was (and is) a performing art about which I know little, and with which I’m least engaged. Yet I saw something there—felt it—that let me know that here was an art with depth and breadth of meaning, of subtext, of storytelling. I felt that again, I confirmed it, these past two weeks, with outdoor, under-the-blazing-stars performances by Groundworks DanceTheater and Urban Bush Women. Their styles, approaches, methods, and stories are vastly different, and I haven’t the words or aptitude to try to interpret or contrast or even to describe them. All I can say was that in each case, in equal measures, I was rapt, fully pulled in, fully experiencing each nuance of motion. 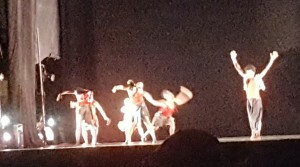 What I hadn’t understood, what I’m still coming to terms with, is that these dancers do very much tell a story; they take the stage in order to encode a message. It is sometimes an anecdote, often an entreaty, not infrequently a desperate demand. The music that gives fluidity to their movements are elements of story, but—and I suspect this is key—silence is too. There’s something strangely unsettling in seeing a long stretch of choreography unaccompanied by music. The audience becomes supernaturally still, and all that can be heard is the slap and stomp of the dancers’ feet, and the sounds of their exertions. The music goes missing, the dance goes on. There are obvious theses to what they’re telling me from the stage, but there are much more subtle revelations hidden within the nested layers, some of which I’m not entirely sure I was meant to understand. That is a reminder and a constant of life writ large. In dance and in everything, I come to terms with it. So dance, I say, is cerebral beyond anything I ever suspected or would have posited. This entry was posted in Homepage and tagged Akron, Art, Ballet Hispanico, dance, Groundworks Dance Theater, Urban Bush Women, What is art?. Bookmark the permalink.